▪ Set up options for the live Previews as explained below. ▪ Use V-Sync - Activates the Vertical Synchronization function of your graphics card for your display monitor or output device. V-Sync is activated by default. 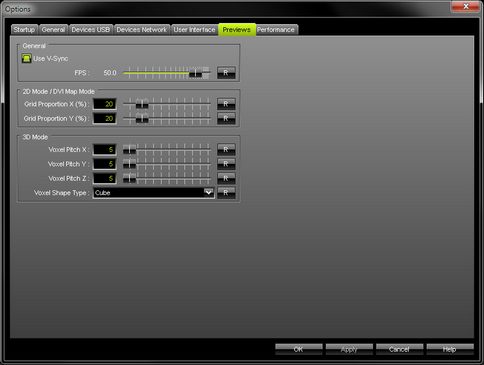 ▪ FPS - Allows you to manually set the frame rate of the 3 Previews and 2 External Previews in Frames Per Second. - A higher number of frames generates smoother results, but requires much more computer performance. - This option can be set independently of V-Sync. But if V-Sync is activated, the maximum frame rate will be set by the highest possible V-Sync frame rate of your monitor or output device, even if you entered a higher number. You can influence how the Previews display your effects. By changing the grid proportions, you can influence the size of the displayed pixels. ▪ Grid Proportion X (%) - Defines the horizontal space between pixels in the Previews. R - Restores the default settings. The default value is 20%. ▪ Grid Proportion Y (%) - Defines the vertical space between pixels in the Previews. ▪ These settings only work for the Previews in 2D Mode [as well as DVI Map Mode for the External Previews]. In this way, you can better adjust the display mode to the physical layout of your LED fixtures. ▪ Voxel Pitch X - Defines the horizontal spacing factor between voxels in the Previews [as multiple of the voxel size]. A value of 1 means that there is no spacing. R - Restores the default settings. The default value is 5. ▪ Voxel Pitch Y - Defines the vertical spacing factor between voxels in the Previews [as multiple of the voxel size]. A value of 1 means that there is no spacing. ▪ Voxel Pitch Z - Defines the spacing factor between voxels in the Previews regarding the depth [as multiple of the voxel size]. A value of 1 means that there is no spacing. ▪ Voxel Shape Type - Changes how voxels are shown in the Previews. Choose from 4 different types [Square, Circle, Cube, Sphere]. - Square and Circle are flat 2D shapes, while Cube and Sphere show voxels as actual 3D shapes. - The default Voxel Shape Type is Cube. - Voxel Shape Tape Square offers the highest performance, then Circle, then Cube, then Sphere. ▪ All options of Previews will be saved locally on your computer. The settings described in this topic will not be saved in your MADRIX Setup file.